Many countries have embarked on a quest for what seems to be some sort of Holy Grail: the formalization of the artisanal and small-scale mining (ASM) sector. Over 40 million people globally are involved in ASM, and at least 150 million depend on the sector thanks to the sector’s positive spillover effects on rural economies. However, approximately 80 per cent of small-scale miners are informal, which gives rise to many sustainable development challenges. Spearheaded by donors such as the World Bank, the push for formalization has never been greater. This is relevant whether the concerns emerge from a human rights and security point of view or are related to environmental and health issues. International policy mechanisms, such as the OECD Due Diligence Guidance for Responsible Supply Chains of Minerals from Conflict-Affected and High-Risk Areas and the Minamata Convention on Mercury, promote formalization as an essential step toward mitigating the sector’s various negative impacts and to unlock its full (and increasingly recognized) development potential. Similarly, regional policy mechanisms, such as the International Conference on the Great Lakes Region’s (ICGLR) Regional Initiative against the Illegal Exploitation of Natural Resources (RINR), recognize formalization as an essential starting point. Likewise, many governments are currently overhauling policy frameworks in an attempt to formalize—at least parts of—the sector. Although formalization is often discussed and written about—and modest achievements made—many countries still face significant challenges. There is a continued need for step-by-step guidance and support on the complex formalization process. After all, what exactly does formalization entail? ASM actors (e.g., miners and traders) possess the necessary licenses and permits. ASM actors are organized in legitimate entities that represent their needs. Policies are implemented, monitored and enforced. ASM actors have access to technical, administrative and financial support that empowers them to comply with requirements prescribed by national regulations. Clearly, formalization is a multidimensional process, containing many components, ranging from allocating land and facilitating miners’ organizations, to providing access to finance and enforcing regulations. In short, formalization of the ASM sector is not easy. 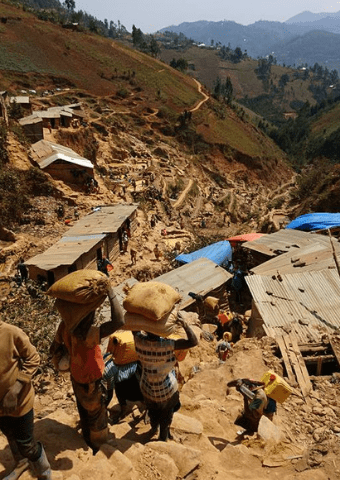 It is an ongoing, long-term process that may take decades to accomplish in difficult environments, and in many countries there will likely always be some informal ASM miners and traders. However, by designing a comprehensive and pragmatic approach that is informed by the local realities of the sector and addresses the interests of the various stakeholders, substantial progress can be made in selected areas. Moreover, it is also the formalization process itself—which is fundamentally a process of development, and can contribute to state building—that matters. Taking a human rights-based approach to formalization, which focuses on the rights and duties of both mining actors and the government in a bottom-up, participatory process, can help to address the root causes of the sector’s informal nature and its related deficiencies. The Handbook for Developing National ASGM Formalization Strategies within National Action Plans, developed by UNITAR and the UN Environment Global Mercury Partnership, provides guidance for such an approach. The handbook builds on the IGF Guidance for Governments: Managing artisanal and small-scale mining, and was launched at the IGF’s Annual General Meeting last October in Geneva. It has been developed in support of the Minamata Convention on Mercury and focuses specifically on artisanal and small-scale gold mining (ASGM), but it can also be useful for the wider ASM sector. 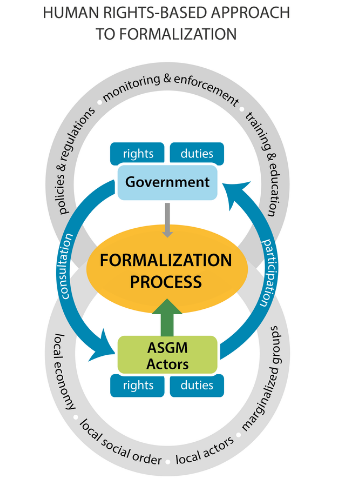 The handbook provides a comprehensive introduction to ASGM formalization, including key concepts and best practices, and subsequently provides step-by-step guidance for developing a strategy for formalizing the sector. The Formalization Handbook can be downloaded here.